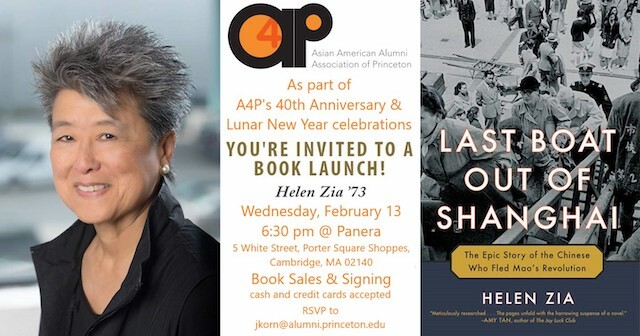 Activist and author Helen Zia '73 as she launches her latest book, _Last Boat Out of Shanghai: The Epic Story of the Chinese Who Fled Mao's Revolution_. Wednesday, February 13, at 6:30 pm at Panera Bread Porter Sq. Helen Zia will discuss her book, followed by an audience Q&A session. Helen will also sign her book that will be for sale on-site. A limited number of books will be available to purchase at the event on-site, sold by Porter Square Books. Cash and credit cards accepted. Panera Bread Porter Sq is accessible by the MBTA Red line Porter Square stop. There is also a free parking lot right in front of the Panera. We will be DOWNSTAIRS. Helen Zia is the author of _Asian American Dreams: The Emergence of an American People,_ a finalist for the prestigious Kiriyama Pacific Rim Book Prize. She was Executive Editor of Ms. Magazine and is a founding board co-chair of the Women's Media Center. Her articles, essays and reviews have appeared in numerous publications, books and anthologies, receiving awards for her ground-breaking stories.